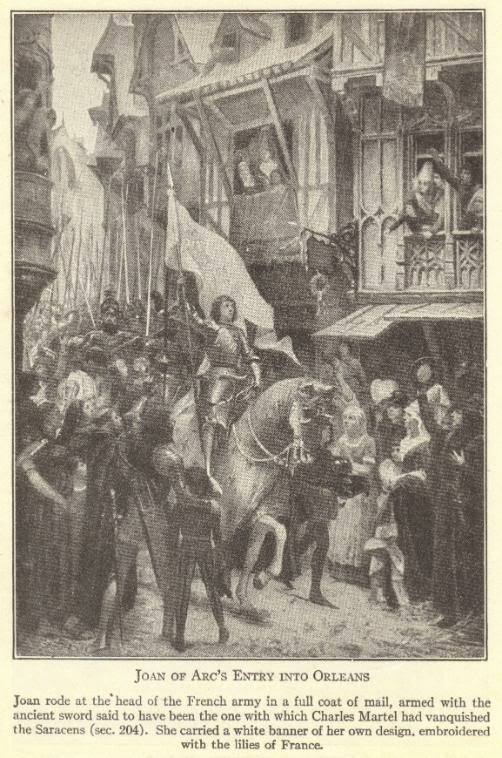 This image depicts Joan of Arc's (c. 1412-1431) entry into Orleans on April 29, 1429. Born a peasant girl in eastern France, Joan (Jeanne d'Arc) rode at the head of the French army during the Hundred Years' War in a full coat of mail, armed with the ancient sword said to have been the one with which Charles Martel had vanquished the Saracens. She carried a white banner of her own design, embroidered with the lilies of France.